Definition at line 35 of file parser.cc. Definition at line 74 of file parser.cc. Definition at line 83 of file parser.cc. Definition at line 38 of file parser.cc. Definition at line 94 of file parser.cc. Definition at line 98 of file parser.cc. Definition at line 102 of file parser.cc. References fncId_, fncInitDeclSent_, fncInitDefSent_, fncType_, and type_. Definition at line 109 of file parser.cc. Definition at line 114 of file parser.cc. Definition at line 119 of file parser.cc. Definition at line 124 of file parser.cc. References builder_, initDeclIfNeeded(), and type_. Definition at line 129 of file parser.cc. References builder_, initDefIfNeeded(), and type_. Definition at line 134 of file parser.cc. Definition at line 48 of file parser.cc. Definition at line 49 of file parser.cc. Definition at line 50 of file parser.cc. Definition at line 51 of file parser.cc. Definition at line 53 of file parser.cc. Definition at line 54 of file parser.cc. Definition at line 55 of file parser.cc. Definition at line 56 of file parser.cc. Definition at line 57 of file parser.cc. Definition at line 139 of file parser.cc. References StreamDecorator::C_LIGHT_PURPLE, StreamDecorator::C_NO_COLOR, ETOKEN_NULL, fncPrint_, and stack_. Definition at line 150 of file parser.cc. References StreamDecorator::C_LIGHT_PURPLE, StreamDecorator::C_NO_COLOR, BisonListener::TFncCall::first, BisonListener::TFncCall::second, and stack_. Definition at line 162 of file parser.cc. References builder_, chkStack(), StreamDecorator::E_ERROR, IBuilder::errorDetected(), fileName_, BisonListener::TFncCall::first, fncPrint_, stack_, Token::text, and type_. Definition at line 174 of file parser.cc. 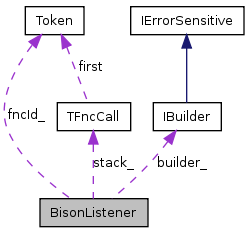 References builder_, StreamDecorator::C_LIGHT_PURPLE, StreamDecorator::C_NO_COLOR, chkStack(), ETOKEN_NULL, BisonListener::TFncCall::first, fncPrint_, BisonListener::TFncCall::second, and stack_. Definition at line 192 of file parser.cc. References builder_, StreamDecorator::C_LIGHT_PURPLE, StreamDecorator::C_NO_COLOR, chkStack(), BisonListener::TFncCall::first, BisonListener::TFncCall::second, and stack_. Definition at line 207 of file parser.cc. References builder_, errMixedDeclDef(), fncId_, fncInitDeclSent_, fncInitDefSent_, and fncType_. 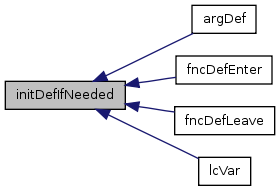 Referenced by argDecl(), and fncDecl(). Definition at line 220 of file parser.cc. Referenced by argDef(), fncDefEnter(), fncDefLeave(), and lcVar(). Definition at line 242 of file parser.cc. References builder_, StreamDecorator::E_ERROR, fileName_, and fncId_. Referenced by initDeclIfNeeded(), and initDefIfNeeded(). Definition at line 233 of file parser.cc. References builder_, StreamDecorator::E_ERROR, fileName_, and stack_. Referenced by fncCallAsCmd(), fncCallAsExpr(), and fncCallPrintArg(). Definition at line 64 of file parser.cc. Referenced by argDecl(), argDef(), assign(), chkStack(), errMixedDeclDef(), evalBinOp(), evalUnOp(), fncCallAsCmd(), fncCallAsExpr(), fncCallPrintArg(), fncDecl(), fncDefEnter(), fncDefLeave(), glVar(), ifElse(), ifEnter(), ifLeave(), initDeclIfNeeded(), initDefIfNeeded(), lcVar(), pushToken(), whileEnter(), whileInit(), and whileLeave(). Definition at line 65 of file parser.cc. Referenced by chkStack(), errMixedDeclDef(), and fncCallPrintArg(). Referenced by argDecl(), argDef(), fncCallPrintArg(), fncInit(), glVar(), lcVar(), and setType(). Definition at line 67 of file parser.cc. Referenced by fncInit(), initDeclIfNeeded(), and initDefIfNeeded(). Definition at line 68 of file parser.cc. 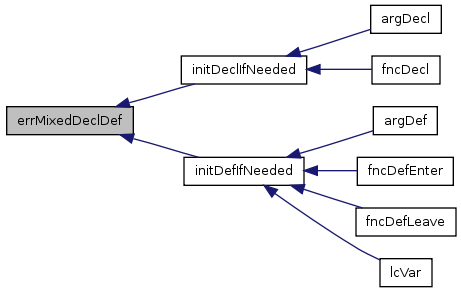 Referenced by errMixedDeclDef(), fncInit(), initDeclIfNeeded(), and initDefIfNeeded(). Definition at line 69 of file parser.cc. Definition at line 70 of file parser.cc. Definition at line 71 of file parser.cc. Referenced by fncCallAsCmd(), fncCallInit(), and fncCallPrintArg(). Definition at line 75 of file parser.cc. Referenced by chkStack(), fncCallArg(), fncCallAsCmd(), fncCallAsExpr(), fncCallInit(), and fncCallPrintArg().